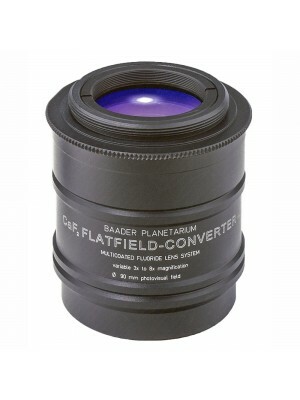 Baader Carl Zeiss 2x Barlow lens 31.8mm with T2 thread, made in Germany by Carl Zeiss in Jena, 31,8mm/T2 ClickLock eyepiece clamp by Baader Planetarium. Visual Barlow lens and photographic eyepiece projection in one system. Direct T2 Adaption possible, it extends magnification up to 3x without loss of quality. The image quality is only exceeded by Baader 4x-8x flat field FFC-Converter, in case the projection factor exceeds 4x. The Carl Zeiss Abbe Barlow lens consists of two parts. The front barlow section ends with a photographic T2 thread suitable to directly connect DSLR camera with T2 adapter. On the rear there is a Baader ClickLock 31,8mm visual back to connect CCD or CMOS camera with 31,8mm nose or eyepieces. Adding proper T2 extensions, an enlargement of the imaging scale up to three times is possible without loss of quality.